Preheat oven to 350°. In a large microwave-safe bowl, melt the butter; stir in the brown sugar. Cool slightly. Beat in eggs, one at a time, and vanilla. In another bowl, whisk together flour, baking powder, salt and cinnamon; stir into butter mixture. Stir in cranberries and chopped chocolate (batter will be thick). Spread into a greased 13x9-in. pan. Bake until golden brown and a toothpick inserted in center comes out clean (do not overbake), 18-21 minutes. Cool completely on a wire rack. For frosting, beat cream cheese, confectioners' sugar and, if desired, orange zest until smooth. Gradually beat in half of the melted white chocolate; spread over blondies. 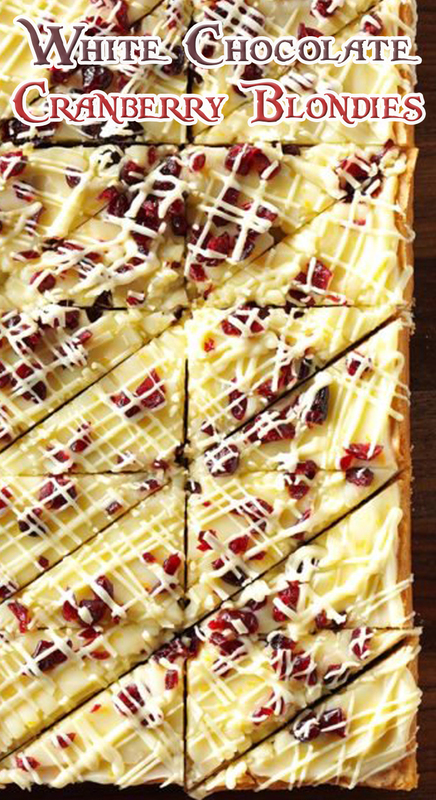 Sprinkle with cranberries; drizzle with remaining melted chocolate. Cut into triangles. Store in an airtight container in the refrigerator.